WEST LAFAYETTE, Ind. 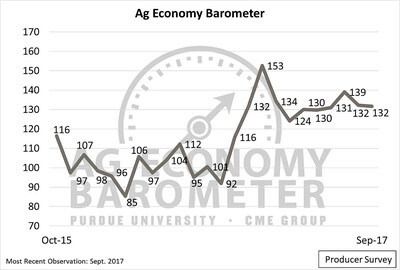 and CHICAGO, Oct. 3, 2017 /PRNewswire/ -- Producers' optimism about the future of the agricultural economy fell in September, according to the Index of Future Expectations, a sub-index of the Purdue University/CME Group Ag Economy Barometer. The overall barometer held steady from August to September with a reading of 132 as its two sub-indices – the Index of Future Expectations and the Index of Current Conditions – shifted in opposite directions. The Index of Future Expectations fell seven points to 130 in September, while the Index of Current Conditions climbed from 122 in August to 135 in September. The Ag Economy Barometer is based on a monthly survey of 400 U.S. agricultural producers. "Although the decline in the Index of Future Expectations was modest, it could be an indication that some of the optimism that surfaced among producers in late 2016 and early 2017 is eroding," said Jim Mintert, director of Purdue's Center for Commercial Agriculture and principal investigator for the barometer. "One of the drivers of the jump in producer sentiment after the 2016 U.S. presidential election was a sharp increase in expectations about the U.S. economy. But the last two times the barometer survey has posed questions about the overall economy, respondents were noticeably less optimistic." For example, on the September survey, just 40 percent of the respondents said the U.S. economy was likely to expand, a decline of almost one-third from March when nearly 60 percent said they expected expansion. Another topic on the September survey was trade agreements and negotiations, specifically the North American Free Trade Agreement, or NAFTA. The survey asked respondents whether NAFTA has been good or bad for the U.S. economy and, separately, for U.S. farmers and ranchers. In both cases, more producers than not reported that the agreement had been good. In the case of the U.S. economy, 52 percent of respondents said they thought NAFTA had been good. Fifty-nine percent reported that they thought the agreement had been good for U.S. farmers and ranchers. In contrast, back in February, 93 percent of respondents said trade was important to the U.S. agricultural economy and 80 percent of producers said trade was important to their farms. The differences among the responses to the more general trade questions and those that focused specifically on NAFTA suggest there is some uncertainty among producers about the impact of NAFTA, Mintert said. Moreover, Mintert said, just looking at the percentage of favorable responses regarding the impact of NAFTA might not tell the whole story. "An unusually large percentage of survey participants - 24 percent in the case of the U.S. economy and 20 percent in the case of farmers and ranchers - opted not to answer these two questions," he said. "Although we can't say for sure why producers opted not to respond to these two questions, it might also reflect a relatively high degree of uncertainty regarding NAFTA's impact." The full September report includes more information about producers' sentiment toward NAFTA, their expectations for the stock market in 12 months, and what they think might happen with the U.S. economy in the next year. Read the full report at http://purdue.edu/agbarometer. As the world's leading and most diverse derivatives marketplace, CME Group (www.cmegroup.com) is where the world comes to manage risk. Through its exchanges, CME Group offers the widest range of global benchmark products across all major asset classes, including futures and options based on interest rates, equity indexes, foreign exchange, energy, agricultural products and metals. CME Group provides electronic trading globally on its CME Globex platform. The company also offers clearing and settlement services across asset classes for exchange-traded and over-the-counter derivatives through its clearinghouses CME Clearing and CME Clearing Europe. CME Group's products and services ensure that businesses around the world can effectively manage risk and achieve growth. CME Group, the Globe logo, CME, Chicago Mercantile Exchange, Globex and E-mini are trademarks of Chicago Mercantile Exchange Inc. CBOT, Chicago Board of Trade, KCBT and Kansas City Board of Trade are trademarks of Board of Trade of the City of Chicago, Inc. NYMEX, New York Mercantile Exchange and ClearPort are trademarks of New York Mercantile Exchange, Inc. COMEX is a trademark of Commodity Exchange, Inc. Dow Jones, Dow Jones Industrial Average, S&P 500 and S&P are service and/or trademarks of Dow Jones Trademark Holdings LLC, Standard & Poor's Financial Services LLC and S&P/Dow Jones Indices LLC, as the case may be, and have been licensed for use by Chicago Mercantile Exchange Inc. All other trademarks are the property of their respective owners.